You are here: Home >Special > HOT DEAL! 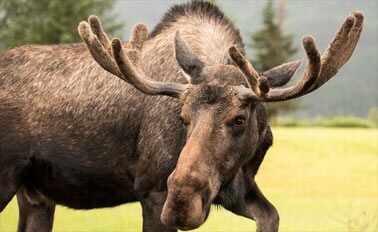 14 Day Best of the West Alaska Cruisetour From $1569 US! HOT DEAL! 14 Day Best of the West Alaska Cruisetour From $1569 US! 14 Day Best Of The West Alaska Cruisetour Special! Princess Alaska Cruisetours showcase the best of Alaska, including iconic Denali National Park. This 14 day cruisetour package features 2 nights in Vancouver, a 7 night Inside Passage Alaska cruise, and 4 nights on land touring Alaska by comfortable coach and luxury rail. Nothing beats the thrill of an Alaskan train vacation. Riding the rails through majestic mountains, over rushing rivers, and through vast valleys is a once-in-a-lifetime experience. During your stay in Denali, every kind of Alaska exploration is at your doorstep: white water rafting at the Nenana Gorge, tundra mountain golfing, or jet boat, helicopter and flightseeing tours featuring the impressive Denali Mountain (Mt. McKinley). Don't delay booking this incredible journey. Enjoy the Best of Vancouver & Alaska! This Alaska McKinley Cruise Tour package features 2 night in Vancouver, a 7 night Voyage of the Glaciers cruise, 2 nights at the Denali Princess Wilderness Lodge, 1 night at the Mt. McKinley Princess Wilderness Lodge, and 1 night in Anchorage. Additionally, you'll experience two different glacier areas including dazzling Glacier Bay National Park, and you'll visit the frontier ports of Skagway, Juneau and Ketchikan. Princess also offers an array of optional land excursions, allowing you to experience the area in every way imaginable, from river rafting and wildlife viewing to flightseeing, fishing and more. Arrive into Vancouver. Transfer yourself to your deluxe downtown hotel. Overnight in Vancouver. Enjoy a full-day tour to beautiful Victoria! You'll travel via BC Ferry to Vancouver Island where you'll experience a Victoria City Tour, time to explore the city on your own (try a visit to the Parliament Buildings, the Royal British Columbia Museum or Afternoon Tea at the Empress), entrance into Butchart Gardens is included this afternoon before returning to Vancouver. Overnight in Vancouver. This morning you'll enjoy a scenic half-day Vancouver City Tour which features Stanley Park, English Bay, Gastown, Chinatown, Robson Street, and Granville Island. Then, board your Princess ship and set sail out of Vancouver and into the Inside Passage. 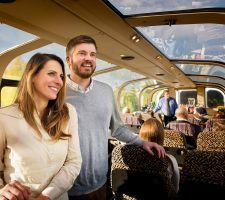 Direct-to-the-Wilderness rail service provides a fabulous beginning to an incredible journey, with magnificent scenery and friendly Princess service all along the way. You'll arrive refreshed for your very first night on land in Alaska at the Denali Princess Wilderness Lodge. Easy trails link the various places to shop and dine in this campus setting. And of course, no matter where you are, the natural splendor of the park is never far away. Overnight at the Denali Princess Wilderness Lodge. You have a full day to get out into one of America's best national parks. This morning, a Natural History Tour serves as a wonderful introduction to the animals, plants and geological features found there. Later today, you may want to stop by the tour desk to plan an activity such as rafting or hiking. Overnight at the Denali Princess Wilderness Lodge. The views along the route from the Denali Lodge to our Mt. McKinley Princess Wilderness Lodge aboard our motorcoach are truly sensational. But the main attraction is the 20,310-foot mountain itself, visible from nearly anywhere on the lodge's property. Overnight at the Mt. McKinley Princess Wilderness Lodge. You'll have the morning to take advantage of optional excursions from the lodge. Then, continue your motorcoach journey to Anchorage. Overnight in Anchorage. Your Alaska Cruise Tour ends this morning in Anchorage. Ask about our direct flight back to Vancouver. Explore Alaska's vast wilderness, National Parks and highways at your own pace! Princess Cruises takes you to Fairbanks and Denali National Park on this 12 Day Alaska Cruisetour special. During your 7 night Alaska cruise you'll view dazzling glaciers, have the opportunity for wildlife viewing and enjoy fresh cuisine from the area. 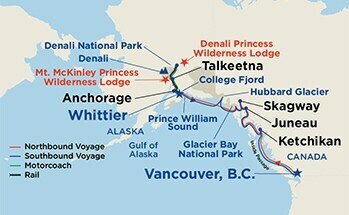 Princess brings National Park Rangers and Alaska experts aboard to enhance your experience. On land within Alaska, enjoy Fairbanks and Denali National Park. You'll have time to fish, dog sled, hike, kayak, horseback ride or white-river raft during your time within Alaska. Don't delay booking this incredible value! This gorgeous Alaska lodge is the perfect starting point for your wilderness adventure. You haven't fully experienced Alaska unless you've been to Denali National Park. Its boundaries encompass an impressive six million acres - the size of the state of Massachusetts. Home to Mt. McKinley, North America's highest peak towers an unbelievable 20,320 feet in the sky. The Park hosts an array of wildlife from moose, caribou, Dall sheep and grizzly bears to gray wolves and red foxes. The Denali Princess Wilderness Lodge is the closest and most comfortable place to stay when visiting the park. The entrance to Denali National Park is located only a mile from our front door. With an expansive deck overlooking the Nenana River with views into the park, Denali Princess Wilderness Lodge is the ideal spot to relax, visit with friends, and savor the exquisite landscape. Picture-perfect wilderness retreat just south of Alaska's Denali National Park. From the moment you arrive at Mt. McKinley Princess Wilderness Lodge in Denali State Park, you know you're somewhere special. Located south of the National Park near the Chulitna River, Mt. McKinley Lodge is a true wilderness retreat with a host of recreational activities, exceptional amenities, and awesome views of Mt. McKinley. Plan a day trip into Talkeenta with our daily shuttle service for only $10 roundtrip or relax on the deck at the lodge after a walk on one of our many hiking trails. Our premier wilderness lodge has it all! All pricing above is in US Dollars, per person. Port charges & taxes are additional. Pricing is based on two people sharing and subject to availability. The "From" price listed on our website is for the May 6th departure date; other dates may have different pricing, please inquire. All pricing is based on availability and subject to change by the cruise line at any time. For more information please contact one of our Alaska Specialists!